Gautam Thakar, Country Manager, eBay India Marketplace felicitating Priyanka Chopra, the eBay Style Diva. eBay India, India's leading online marketplace, today announced the glamorous Bollywood actress Priyanka Chopra as the eBay India Style Diva for the year 2006. In an online poll through June and July, the 2 million strong eBay India community chose Priyanka as the unanimous winner and Style Diva. Gautam Thakar, Country Manager, eBay India Marketplace felicitated the Style Diva in Mumbai today and presented her with the eBay Style Diva trophy. Priyanka Chopra announced an opportunity for all Indians to participate in a charity auction and raise funds for the education of the girl child through reputed NGO – Nanhi Kali. Priyanka donated a unique experience "A day on the sets with Priyanka" to one lucky buyer on eBay India. All one needs to do to spend time with this gorgeous Diva is bid on the eBay India site (www.eBay.in/charity) between August 10 and August 19, 2006. All proceeds will go to the Nanhi Kali foundation which supports education for the girl child in the rural and urban areas of India. "I am thrilled that so many people chose me as the eBay Style Diva. I would like to thank my fans for their support. I have personally used eBay in the past and find it extremely easy, fast and convenient to shop. It feels great to be able to reach out to millions of people over the globe through this exciting platform. I love kids and I hope the charity auction helps raise funds to help Nanhi Kali educate girl children all over India." said eBay Style Diva, Priyanka Chopra. Speaking on the occasion, Gautam Thakar, Country Manager eBay India Marketplace said, "It gives me great pleasure to announce Priyanka Chopra as the eBay Style Diva who is the unanimous choice of the members of the eBay community. At eBay India, we are witnessing a substantial increase in the demand for lifestyle products being bought online whether jewellery, apparel, furniture or even collectibles like coins or stamps. The rising popularity and growing consumer needs is persuading us to focus in this direction and led to the conceptualization of the Style Diva contest." The other nominees of the Style Diva contest were Bollywood beauties – Kareena Kapoor and Bipasha Basu. The 45 days long online contest saw participation from across India and received an astounding number of votes. Out of the thousands of participants, five lucky eBay winners got an opportunity to meet, interact and spend a few precious moments with the newly crowned eBay India Style Diva, Priyanka Chopra! All eligible participants were awarded stylish eBay Style Diva merchandise. eBay has consistently supported charity fundraising both worldwide and in India. 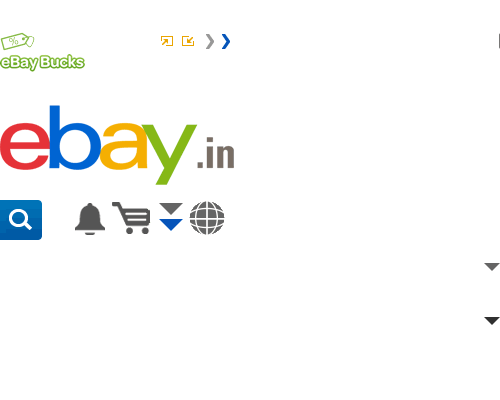 In India, eBay has raised 1.64 crores for NGOs through celebrity and high profile listings as well as direct donations.